We'll ensure you make your mark. Whatever your buoy requirements, you know where you are with Viking Seatech. Anchor pendant and support buoy sizes are normally expressed in terms of the reserve buoyancy rather than the physical dimensions. The reserve buoyancy is equal to the weight of water displaced by the buoy when fully immersed less the buoy's weight in air. A buoy with 6 Tonnes reserve buoyancy would be fully immersed if required to support 6 Tonnes. In practice, as the buoy would be fully submerged, it would be very difficult to locate. Therefore our standard practice is to use around half the reserve buoyancy, ensuring approximately half the buoy is visible above water. The above does not apply to mooring buoys as they need to resist being pulled under the water when high loads are being applied to the mooring hawsers. 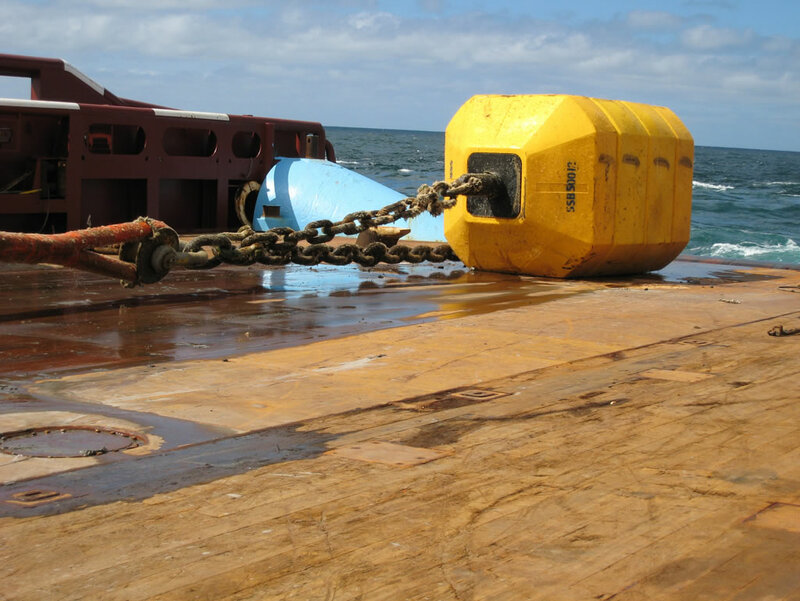 Mooring analysis is generally required to ensure that buoys used in the mooring of vessels are of the correct size and that the structural steel within through the buoy is of a sufficient strength. Navigational buoys are selected on the basis of sea conditions and signal range requirements. Their buoyancy is required to support the moorings and give sufficient freeboard and height for the signals (light and day-marks etc) to be effective. Navigational buoys are also ballasted to aid stability. Whatever you need in terms of buoys, get in touch with us and we'll keep you right.